Elfin Thyme or Thymus serpyllum is a creeping aromatic semi-evergreen thyme that forms a dense mat. Great ground cover thyme. Elfin Thyme produces tiny lavender flowers in summer. Ideal to plant between bricks or paving stones. 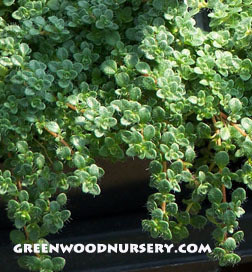 Easy to grow Elfin Thyme plants that do best in light, dry, well-drained soil. Very hardy. Grows to 2 inches in height, space 6 inches apart.